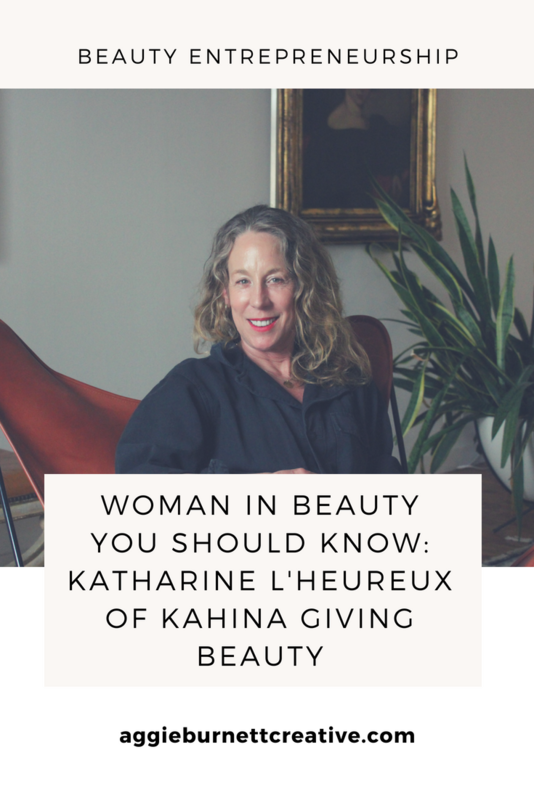 When I first met Katharine at her beautiful Chelsea loft, which also happens to be the headquarters of her natural skincare beauty brand, Kahina Giving Beauty, I was drawn by her easy-going nature and good energy. Three hours later, and we were having a tasting of Kahina’s Culinary Argan Oil (this is a secret Kahina product I can’t get enough of), drinking Cabernet Sauvignon from her family’s Sonoma vineyard, Vine Hill Ranch, and testing out the entire line of luxurious products. Over the course of the afternoon, it became very clear why this team of three (Katharine’s husband, Jim, and daughter, Grace, also work on the brand) has been able to build a brand that has come out on top, amongst hundreds of competitors. They are meticulous about the quality control and sustainability of the ingredients they use in all their formulas, and have a larger company mission focused on employing and giving financial opportunity to the Berber women of Morocco—who extract the organic argan oil—a staple ingredient in their line. We sat down with Katharine to learn the challenges they’ve overcome, the pr and marketing strategies that have been pivotal for growth, and the one book she’s reading right now that has changed her view on aging. 1. What inspired you to start a skincare company? I decided to create KAHINA™ Giving Beauty after discovering argan oil on vacation in Morocco in 2007. I had been looking for simple and effective all natural skincare at the time and was feeling frustrated with the choices available on the market. After purchasing some argan oil at an apothecary in the souk of Marrakesh and saw the results of argan oil on my own skin, I realized that I had found what I was looking for. When I began to learn more about the Berber women of rural Morocco who live in the endangered argan forest, I decided to create a skincare company based on this amazing ingredient that would help to elevate the indigenous people of Morocco. I knew nothing about the beauty business when I started so there was obviously a huge learning curve. There have been tremendous hurdles along the way, ranging from packaging and manufacturing problems to raw material supply shortages and cash flow. I was incredibly lucky to find extremely talented people to help me along the way. There is tons of information and resources to be found on the internet, which I heavily relied on. The challenges continue, but I have some perspective now. I don’t fear that each and every hardship will result in the end of the business. 3. Was there ever a moment when you almost decided to not go forward with your business? Early on I had some issues with my first Moroccan supplier of argan oil. One shipment I received had to be thrown out because it tested positive for bacterial contamination and in another instance I learned that the president of the cooperative was not paying the Berber women who did the work of cracking the nuts. I really thought that doing business in Morocco would be too tough and that I wouldn’t be able to find a reliable supplier of our core ingredient. I was spending a lot of time in Morocco then, and through perseverance and a lot of luck I met my current supplier who produces the best oil that I have ever used and shares my desire to help the Berber women of the argan region. 4. What has been the biggest success for Kahina Giving Beauty so far? How did you celebrate? I don’t feel that our success is due to one event, but rather a series of events, each of them hard won. We celebrate each and every spa, retail and distributor partnership, every influencer post, and each positive customer review. If I were to point to one success though, perhaps it would be having located and developed lasting partnerships with our amazing suppliers. Without the consistent quality of our ingredients, KAHINA™ would not be what it is. I roll out of bed at around 7, brush my teeth and do my morning skincare ritual. I wash off any residue from my skincare routine the night before with our new Oil Cleanser. I follow that with a spritz of Toning Mist, then apply Brightening Serum, Eye Serum and one of our oils (which one depends on my mood and how my skin feels that day). I finish with the Facial Lotion before applying some type of sunscreen. The whole thing takes about two minutes. Then I wake up my 14 year old and we head to the kitchen where my husband usually has coffee ready for me. I love it with some milk and a teaspoon of CocoRau Holy Body powder. Afterwards, I’ll do a quick exercise routine with the 10-minute workout app. I love these iPhone apps for keeping me on track. I know I can always fit at least this much exercise in, in case the rest of the day gets away from me. I’m usually at my desk by 8:30. 6. How do you balance motherhood and entrepreneurship? What are some tips for your mompreneurs juggling both? Working from home has helped a lot. My kids are 24, 22 and 14 now, but when they were younger and I was traveling a lot it was quite challenging. Now that they are older, my work actually adds to the family dynamic instead of detracting. My 24 year old daughter works as our graphic designer and does our order management. I think that having my own business has set the example for them that they can create the life they want to live. And having a business that gives back has shown them that they can make a positive impact in the world. My husband has always been very supportive and ready to pitch in when I was traveling. Now he works with me and we get to travel together! All the products in the KAHINA™ line are products I need and use everyday. If I feel a void in my skincare routine, I’ll work on creating the product that fills it. I begin with envisioning the texture and scent, as well as the packaging and benefits and provide that information to my chemist who then does her magic of formulating. There is usually some back and forth before we agree on the final formula. Then there is testing and certification. The whole process takes about two years from the original idea to bringing a new product to market. 8. What has been the #1 game-changing marketing or pr strategy for Kahina Giving Beauty and why? Well, I used to work in public relations so I am a firm believer. But so much has changed since I worked in the business almost 20 years ago. There was no instagram, for one! I think the relationship that brands can now have with their customer through social media is a real game changer. There are so many ways to communicate our story now. Still, there is never one magic bullet. It takes a consistent effort using all the tools that are available – print, broadcast, and digital. 9. What’s a book that changed your mind and why? Great question! Barbara Ehrenreich’s new book “Natural Causes” sheds (needed) scientific light on the medical and wellness industries. With a PhD in cellular biology, she debunks popular thinking (and doctor’s advice) on topics such as exercise, preventive screenings, and even meditation. In her chapter on “successful aging” she discusses our society’s obsession with “anti-aging”. The current thinking goes that we can control the aging process by controlling our food choices, mental states, exercise habits and sleep schedules. Anything less than looking young well into old age is a personal failure, regardless of economic or social status, or genetics. She dismisses this logic and advises readers to accept aging instead of wasting time slavishly adhering to fad diets and/or punishing exercise programs, living in a state of self-denial/absorption. I used to be an exercise addict and couldn’t go a day without some strenuous cardio. In fact, it has taken me a number of years to relax my attitude and ease the obsession – for the better. Recently, a doctor advised me to exercise more, which was infuriating! After reading this book, I may stop going to the doctor for advice! I actually found the book reassuring and will continue to stay fit and eat healthfully (and take care of my skin! ), but will also continue to create gardens, take long naps, drink wine, and enjoy myself! As important as meditation, these are all activities that promote health and well-being. 10. What’s next for your company? We love the new oil cleanser from Kahina Giving Beauty! We are continually developing new products (as I get older and my skin changes I am always discovering new things that I need), but our real focus now is expanding into new international markets. We are very excited to have the Emirati singer Ahlam Alshami as our brand ambassador in the GCC. She is a mega superstar there and represents a tremendous growth opportunity for us in the Middle Eastern market. My advice for anyone starting a beauty brand is to make sure you have a strong point of view that differentiates you from the multitude of other brands on the market. Being “green” and “clean” aren’t enough. Also, make the investment in good packaging and design, and make sure you meet all regulatory requirements so you get it right at launch. It is expensive and a headache to have to revise packaging and formulas down the road.